Old map by DUMONT D'URVILLE -Carte des Iles Hawaii. 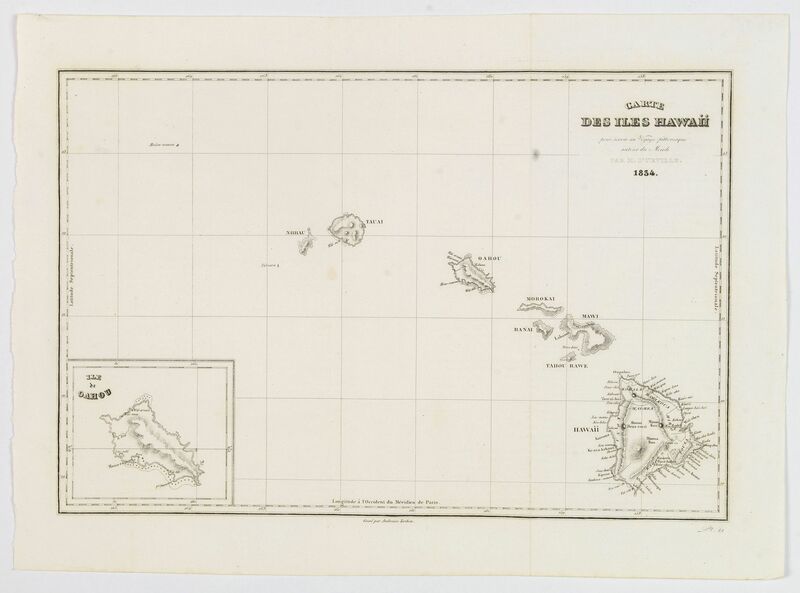 Title: Carte des Iles Hawaii. Size: 8.3 x 13.0 inches. Condition: Folded as issued. Very light spotting, good margins, in excellent condition. A lovely small map of the complete chain of Pacific islands known today as the Hawaiian islands, from Dumont d'Urville's atlas "Voyage pittoresque autour du Monde." This map is one the very first to have the correct English spelling of Hawaii. The islands engraved are: Nihau, Tauai, Oahou, Morokai, Ranai, Tahou Raw-e, Hawaii. The big island is festooned with names and places, and there is also an inset map of Oahou in lower left corner. Dumont d'Urville circumnavigated the globe for a second time between the years 1826-1829, and made many significant discoveries about the Pacific region. His discoveries led the many scattered islands of the South Pacific to be classified into 3 distinct groupings: Micronesia, Melanesia and Polynesia.